is just outside of Selma, IN, southeast of Muncie. 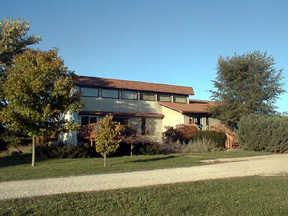 The center is on 320 acres, including woods, prairie, and farmland, with a river marking the east boundary. 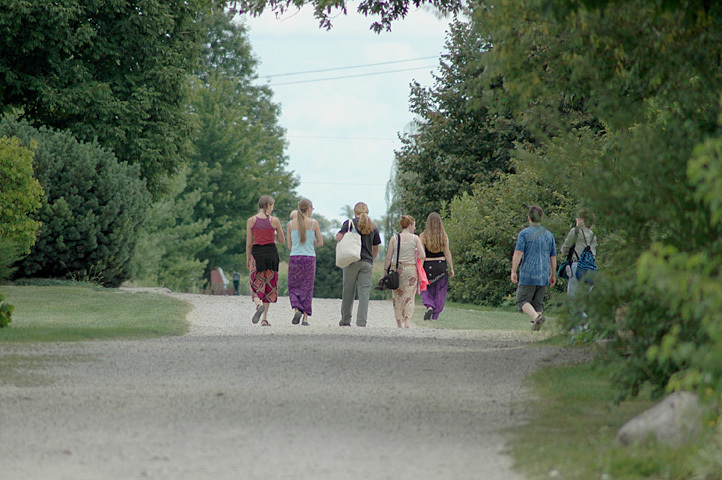 There are hiking trails, incredible gardens, and no neighbors nearby to complain (though we do impose a night-time curfew on drumming, since outdoor drumming can travel a long way on quiet nights)! It’s a wonderful place to reconnect with nature, explore, and relax. Oakwood is a place of amazing peace, and many visitors report the presence of a palpable anti-stress barrier at the property’s borders… so feel free to leave your stress at the road. You can choose to pick it up again when you leave, or leave it behind you forever! 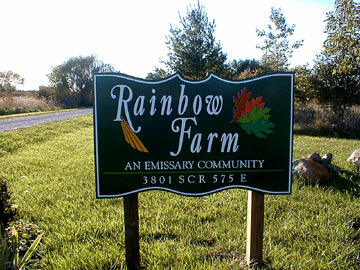 The farm is easily accessible from I-69 from the north, south, and west, and from I-70 to IN Highway 3 from the east. It’s located a little over an hour north of Indianapolis; 3.25 hours from Lansing; four hours from Ann Arbor; three hours from Louisville; 3.5 hours from Columbus (OH), four hours from Chicago; three hours from Cincinnati; or six hours from St. Louis. Your housing will be in cozy rooms with shared baths. 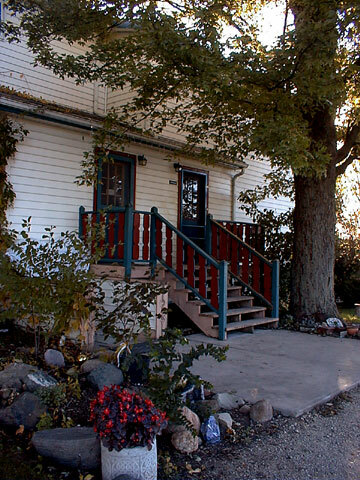 The rooms are located in the Community Building, the old farmhouse, and several other houses on the property; all are nicely decorated, very comfortable, and include bedding, towels, and soap. Indiana in the spring can bring anything from snow (sideways… really!) to balmy temperatures, so come prepared for weather variety! If you prefer to stay in a hotel or motel, Oakwood can suggest the closest ones. Please reserve early because Ball State is in Muncie anduniversity weekend functions tend to fill up the local hotels and motels early. Oakwood is famous for its food. The kitchen serves three healthful and delicious meals a day, all made from scratch, and many meals include vegetables, herbs, and beef (all organic) grown and raised on the property. Meals include a meat and vegetarian option, and vegan or other special meals (allergies, religious dietary practices) can be made with sufficient notice. If you want vegan or special meals, please contact Oakwood at least two weeks before the event to ensure that your dietary needs can be met. The food is incredible, and many people say it’s worth going to Oakwood just to eat. Homemade breads, salad dressings, and desserts are highlights. For this event, coffee and tea will be available all day, and fruit will be available for snacks. Organic sodas, spritzers, and fair-trade chocolate can be purchased in the basement of the Community Center. Class spaces will be scheduled for indoor spaces, either in the community building or in the living room of one of the houses on the property. 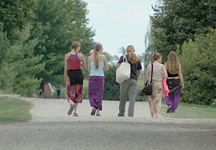 Movement classes may go outdoors if weather permits. Since Oakwood began as a working farm, there is a roofless silo that’s been turned into an amazing place to make music. Sonic magic happens in the silo; it’s like getting a sound massage in every cell of your body. It’s such a special place that an attendee at an early event named it the “Sacred Silo,” and it is. Come experience the magic! Contact Sally by email or at 317-251-8099 if you have questions about physical limitations and class activities. Sally, many of the event faculty, and the Oakwood staff have considerable experience working with people with physical limitations (and we have some ourselves!) and we will do our best to accommodate your needs if we possibly can. We appreciate as much lead time as possible to create solutions with you that focus on your abilities. We also expect individuals to adapt drumming and dance movements to their own capabilities, so we’ve had women who dance seated and those who drum one-handed, and a good time has been had by all! There is none. 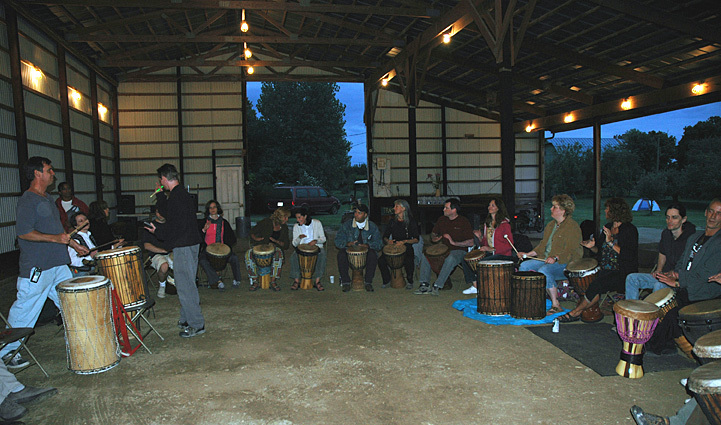 Every time child care has come up, women of all ages who attend the women’s drumming events on a regular basis have asked that the events remain child-free because this is time they give to themselves to take care of themselves, and the mothers with young children seem to be the most adamant about it. We realize that some people will disagree with this decision, but the large majority of regular attendees prefer to keep the weekend child-free to preserve “me” time and space. Mature teens under 18 are welcome to attend with a female relative or guardian.